In any case, these things are fun to collect, and there's always something new to discover. 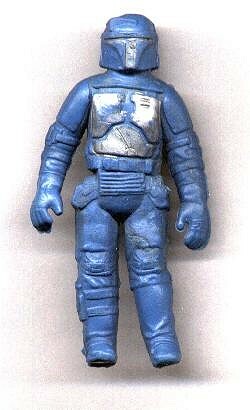 This photo shows a non-articulated rendition of the Boba Fett figure. As you can see, it has the Biker Scout limbs common to a lot of these bootleg figures. Its very similar to the two non-articulated figures seen here, though its interesting to note that the blue rubber of this example is a good deal lighter than that of the figure seen on the right of that image.